Since childhood I've been fascinated by pudding cakes that magically form two layers from just one batter. This one was inspired by America's Test Kitchen and several others, and I made it 4 servings rather than my usual 8 in order to fit in my toaster oven for cool baking on a hot day. What is more refreshing than lemon on a hot summer day? 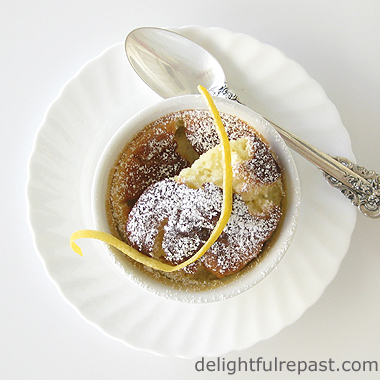 Especially Meyer lemon (but you can use whatever lemons you happen to have). And I've made this as no-fuss as possible because who wants to be slaving over a hot stove--and then afterward, over a hot sink!--in weather like this? If you don't have a toaster oven and an immersion blender, just use a regular oven and a mixer. I can't decide which is my favorite part--the airy layer of cake on top or the luscious layer of lemon pudding on the bottom. Are you a lemon fan? 1 In small saucepan heat milk and cream to a simmer. Stir in lemon zest; cover and steep for 15 minutes. Strain into a small bowl or 1-cup glass measure. 2 Preheat toaster oven or oven to 325F/165C/Gas3. Place a dishcloth in the bottom of an 8x8x2-inch baking dish. 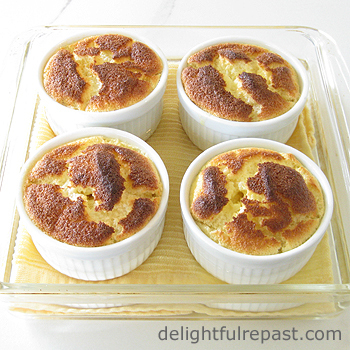 Set four 7-ounce ramekins in the dish. Add cold tap water to the dish to reach about 1/3 up the sides of the ramekins. 3 In small bowl whisk together 1/3 cup sugar, flour, salt and baking powder. Add yolks, vanilla extract and lemon juice. 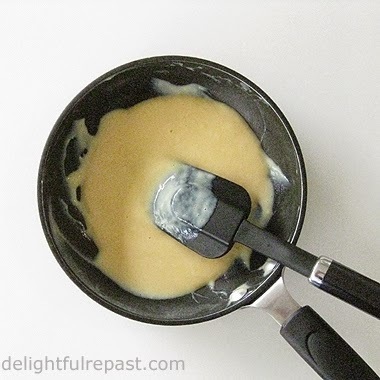 whisk just until smooth, then whisk in milk and cream. 4 With immersion blender's whisk attachment in place, whisk the two egg whites for about a minute on low speed until they're getting foamy, then about a minute on high speed to soft peaks. Gradually whisk in 3 tablespoons sugar. Do not overbeat egg whites; if beaten to stiff peaks they will not fold in well. 5 Whisk about a fourth of the whites into the batter to lighten it, then lightly fold in the remaining whites. Pour into ramekins, nearly to the top. Bake for about 30 minutes. An instant-read thermometer inserted in the center of one of the puddings should register 172F/78C. 6 Cool in water bath for 10 minutes, then remove ramekins to wire rack to cool completely. It could be served slightly warm or cold, but I like it best at room temperature. Just before serving, dust with powdered sugar. 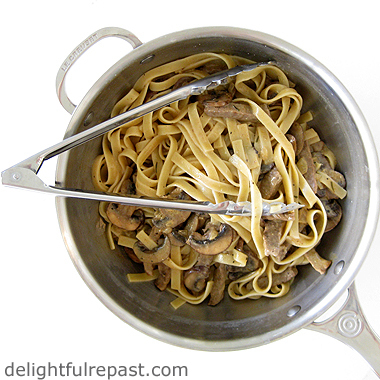 Beef Stroganoff is something I hadn't made in a very long time until my husband brought it up the other day, saying I hadn't made it in probably 20 years. So I thought ... hmm ... seems like I'm not running that one into the ground, think I'll make it. It's kind of a retro thing, isn't it? I used a more affordable cut of organic beef, "stir-fry" beef, and simmered the meat in the sauce for about 20 minutes. It probably needed two or three times that long to render it really tender, but I was in a hurry so it was a little chewy. Mr. Delightful suggested I loosen the purse strings next time and get a tender cut of beef and cook it briefly. Hmph! What a spendthrift! But the sauce was lovely. I just sort of made it up as I went along and wrote it down in case I wanted to make it again. And I do! I seem to recall using wide egg noodles in the past, but I used fettuccine this time. How about you? Are you a Stroganoff fan? 1 Heat olive oil in skillet, and cook onion until softened, about 5 minutes, seasoning with about 1/8 teaspoon each salt and pepper. Pour into 1-quart bowl. Add 1 tablespoon butter to skillet, and cook mushrooms until tender, about 5 minutes, seasoning with about 1/8 teaspoon each salt and pepper. Add to onions in bowl. 2 Add 1 tablespoon butter to skillet and increase heat to medium-high. Add beef strips to hot pan and cook until well-browned, seasoning with about 1/4 teaspoon each salt and pepper and the paprika, tarragon, allspice and nutmeg. Stir in 1 1/4 cups of broth, deglazing pan. Cover and simmer over low heat for 40 minutes, or until tender. 3 After 10 minutes, in 3.5- to 4-quart pan, put 2 quarts of water, salted with about 1/2 teaspoon of salt, on to boil. When the water comes to a boil, stir in the fettuccine and cook for as long as indicated on the package. Note: I used my gorgeous Le Creuset 3.5-quart tri-ply stainless steel saucier so I could serve it right in the pan. 4 Meanwhile, shake together the flour and remaining 1/4 cup broth until smooth. Stir it into the beef and broth. Stir in the onions and mushrooms. Continue simmering until the fettuccine has been cooked and drained. 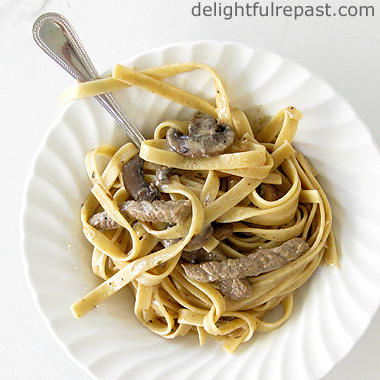 5 Stir the sour cream into the beef mixture, then pour the Stroganoff into the fettuccine and toss until combined. Serve immediately. 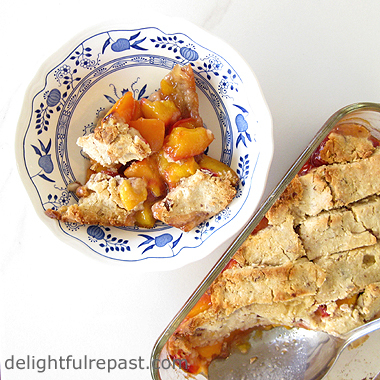 Peach cobbler (or any fruit cobbler) is one of those things people feel strongly about. Some insist on a biscuit topping; others, a cake-y topping. Me? I must do it my Southern grandmother's way: with pie crust. But I put a little different spin on it. Peach cobbler, the way I make it, is like peach pie, but much easier. Even if you don't "do" pie crust, you can do my Easy No-Roll Pie Crust. Of course, even among those who agree with me that cobbler must be made with pie crust, there is still controversy: top and bottom crust or top crust only. Grandma made her cobblers with pie crust, top and bottom, which explains why I make mine that way. Don't get me wrong, if you serve me one of those other types of cobblers, I'm going to lap it up; but I have to make mine Grandma's way! This time I added a half cup of finely chopped pecans to the pastry because peaches and pecans go so well together. What's your favorite kind of cobbler? 1 Preheat oven to 400F/200C/Gas6. In large bowl, whisk together flour, salt and baking powder. Add half the butter and with pastry blender cut butter into flour until mixture has the consistency of coarse meal. Cut in remaining butter until the butter is the size of small peas. 2 In one-cup glass measure, combine lemon juice or cider vinegar and enough ice water to make 3/4 cup. Sprinkle 1/2 cup of it over flour mixture; stir with large fork. Pinch dough with fingers; if dough is dry and does not hold together, stir in a little more ice water a tablespoon at a time until dough holds together. 3 Put half the dough in a 1.5-quart oval Corning French White casserole or 11-by-7-inch 2-quart Pyrex baking dish. Press it out right in the pan (There, now isn't that easier than rolling it out with a rolling pin?). It should be between 1/8- and 1/4-inch thick. If it is thicker than that, just press it partway up the sides of the pan to thin it out. Bake for 15 minutes. 4 Put remaining dough on a lightly floured piece of parchment paper and press it out into a rectangle about 1/4-inch thick. Doesn't have to be smooth, doesn't have to be pretty. Refrigerate until ready to use. Note: Freestone varieties are easiest to work with. 6 As soon as you remove prebaked crust from oven, add sugar mixture to peaches and stir gently to combine. Pour over prebaked pastry. Remove top pastry from refrigerator, and cut into pieces and place them over berries in no particular way (doesn't matter if the pieces overlap or there are bare spots). You may not need all the pastry. 7 Bake for 30 minutes; reduce heat to 350F/180C/Gas4 and continue baking until pastry is nicely browned and peaches are bubbling, about 30 minutes. I do love the flavor of a certain brand of mayonnaise I grew up with, but it is not organic; so I prefer homemade. And I make mine with gently cooked egg so no one will have issues with it because of concerns about salmonella. Be sure to use the freshest eggs and oils for mayonnaise. Eggs lose some of their emulsifying ability as they age, and oils can turn rancid and take on "off" flavors. Taste the oils you plan to use; if they don't taste good, your mayonnaise won't taste good. Olive oil alone is too strongly flavored for general-purpose mayonnaise, so I use one part organic extra virgin olive oil and three parts organic canola oil. I always buy non-GMO organic expeller pressed (pressed without chemicals and high-speed presses that generate heat) oil. 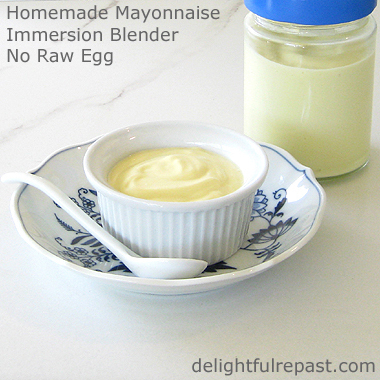 If you don't have an immersion blender but you do have a food processor, try my Food Processor Mayonnaise. If you want to do it by hand with a whisk, you're on your own; I haven't done that in years! Not that it's difficult, but my beating arm is having issues these days. 2 Transfer the mixture to a small nonstick skillet and heat over very low heat, stirring with a spatula, until the mixture starts to thicken. It should register 160F/71C on an instant-read thermometer; do not allow mixture to reach 170F/76C. Remove from heat, set pan in another pan of ice and water, and stir until the mixture has cooled to room temperature. Pour into 16-ounce mixing beaker. Measure the oils into the beaker. 3 Stand the immersion blender in the beaker. With the blender blade in one spot touching the bottom, blend on low speed until the mixture begins to thicken, about 5 to 10 seconds. With the blender on low, slowly pull the blade up to the top of the beaker. Continue, moving the blender slowly up and down until thick, about 25 to 30 seconds longer. Taste and adjust seasoning. 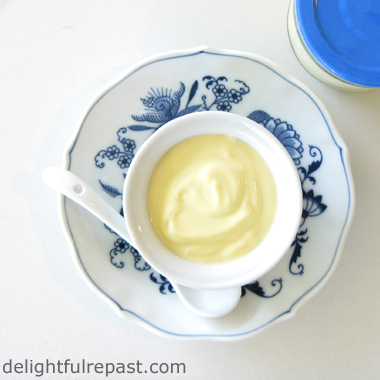 4 Scrape mayonnaise into a glass jar or container, cover and refrigerate. Can be refrigerated up to 4 days (some people say longer). I rarely use that much mayonnaise in such a short time, so I divide it between two jars and give one to a friend.